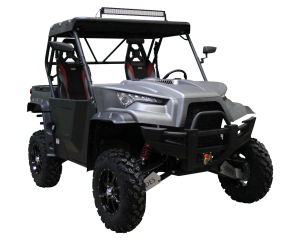 The ODES Industries 2019 Dominator X2 LT Zeus features a touchscreen and LED lighting. 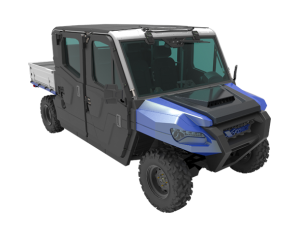 ODES Industries, self-described as a value UTV brand, recently announced their 2019 UTV lineup as they push for even more growth. According to company statements ODEs Industries has been growing for the last several years including a doubling of sales from 2016 to 2017. The 2019 lineup includes 10 models including the new XForce 2 and XForce 4 models which feature an enclosed cab. Probably, these models are aimed at heavy duty work applications in challenging weather environments. Prices range across the lineup from $9,795 up to $23,495. Also, there are three Dominator X4 models which seat six as a result of stadium style seating. 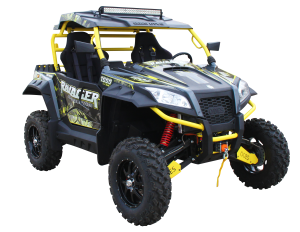 These versions are similar to the two-passenger lineup with a Dominator X4 ST V1($11,295), Dominator X4 LT Zeus V1 ($16,495) and Dominator X4 LT V1 ($14,795). A 1000cc engine powers the sporty Ravager LT Zeus from ODES Industries. ODES Industries added a cab to their latest offering, the Force 4, which seats six. Finally, rounding out the lineup are the two newest models from ODES Industries, the XForce 2 priced at $20,995 and the XForce 4 priced at $23,495. The X2 can seat up to three and the X4 up to six. Both feature AC/Heating systems, heated front seats, 10.6″ LCD touch screen and a 1000cc engine. Standard features include new mapping, GoPro integration, front and rear camera options, temperature controls, digital displays, Bluetooth connection for phone and text display and direct screen audio control. The latter feature makes it easier to just ride rather than play with electronics. ODES Industries is another value brand that appears to be having success offering solid features at a reasonable price. 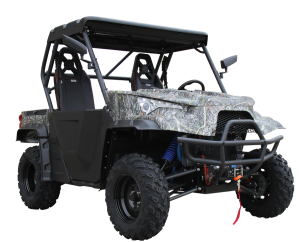 These brands typically have a starting price point in the $9,000 to $10,000 range for their entry level UTV, although some start even lower with fewer features. According to ODES Industries website, they source parts from around the world and partially assemble vehicles in Asia. The remaining assembly appears to be in the US. The company moved assembly from California to Dallas, TX in 2016. This entry was posted in Market entrants, market trends, new vehicle, Pricing info, side-by-side, Technology, utility vehicles and tagged 2019 model year, Dominator, ODES Industries, Ravager, touchscreen, XForce, Zeus by Marc Cesare. Bookmark the permalink.